I like to browse Ebay for unique, homemade wooden toys and Waldorf dolls. Like Etsy, artisans use Ebay to sell their handy work and reach a broader audience. Recently, recalled toys have been showing up on this online auction marketplace. 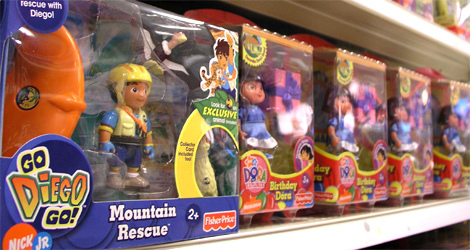 The plethora of recalled toys makes it difficult for consumers to know about every unsafe toy identified by the CPSC. During a recent search, KLTV 7 of Jacksonville, Texas found several recalled toys on Ebay. “It’s disturbing that if someone did not know that these items had been recalled that they were being resold,” said Stephanie Carlton, a concerned mother. “It’s a total lack of concern for someone else’s child.” It does make you wonder…what happens to recalled toys once they have been pulled from the shelves? Despite recent government recalls of millions of hazardous toys, consumer groups are urging parents to be extra vigilant this holiday season because store shelves are still stocked with toys that can pose serious health risks. Yes, that’s right…it is still not safe to simply buy any toy off the toy shelf. Not only are recalled toys still in stores, but the Center for Environmental Health tested 100 toys purchased in November that have not been recalled. Nine of these toys, all of which were manufactured in China, tested positive for high levels of lead. Good luck this holiday season finding safe toys for your children! Great post. I’m sure not only are there recalled toys on the shelves…there are soon to be recalled ones too! Buyers beware. Stores are NOT getting recalled toys off the shelves. And some people have the gall to try to sell stuff on ebay….